Kinmar Bolts are the exciting new kid on the block and are available in a choice of Permanent or Removable types, in a range of sizes available from stock. They require a special matching Kinmar Driver tool to install or remove and are suitable for a wide range of uses including high torque applications. Kinmar Bolts are a patented security product, designed to provide a secure fixing option for a wide range of applications. 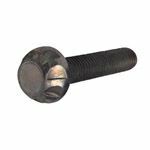 The multi flanged head makes these of these security bolts, ideal for high torque applications and the bolts are available in a choice of two types. Permafix Kinmar security bolts are designed as "One-way" bolts, and are available from stock for next day delivery. Kinmar bolts are also available as "2 way" fastenings in the form of Kinmar Removable Bolts. Both the permafix and removable bolt types require a matching driver tool to install them. however the Permafix bolts are not designed to be removed again, whereas the removable bolts can be removed again at a later date with the aid of the appropriate matching driver tool. M8 gauge Kinmar Permanent Bolts are available from stock in 25mm or 40mm lengths. 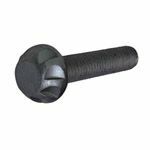 Both the Permafix and Removable kinmat Bolts require a matching Security Driver Tool for installation. Please note however, the driver tools for the two types are different and therefore are not interchangeable.